How does the Leon Frazer investment style, with high exposure to equities that pay growing dividends, fare over time? When interest rates fell from 1982–2009. 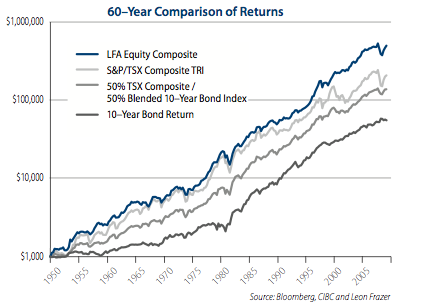 The first chart shows a 60-year comparison of returns based on the LFA Equity Composite, the TSX Total Return Index, a 10-year Canada Bond Total Return Index, and a “balanced” 50-50 mix of the TSX and Bond indices. Over the 60 years shown, the LFA Composite outperformed each of the benchmark indices. Next, we examined the same return streams over the period 1950–1981, when 10-year Canada bond yields rose from 3% to 15%, and from 1982–2009, when bond yields fell from 15% to 3%. diverge considerably, with equities outperforming dramatically. In the declining rate period, the opposite holds true. From 1982–2009, though bonds outperformed stocks, the LFA Equity Composite actually beat bonds. Why does the Leon Frazer dividend-growth style work? We believe it’s because our style is characterized by a higher-than-market dividend yield that grows over time. Having more of a return “up front” amplifies the power of compounding. Second, companies that pay dividends tend to be more stable than companies that don’t, and as a result, fall less when the inevitable market downturn occurs. Finally, a low turnover style reduces the costs associated with transacting, which again leaves more money to compound. Heading into what we believe is a trend towards higher interest rates, we find great comfort knowing the income yields on our equity-oriented client portfolios are competitive with returns available from bonds. We also appreciate that the income in our portfolios can grow with the dividend-growth of our holdings. Unlike fixed-income securities, dividend-growth stocks can see their values rise in inflationary times (as was the case in the seventies and early eighties), thereby providing purchasing power protection to their owners.